Refined enough to be a living room focal point, Chesterfield’s farmhouse-chic appeal delivers function, style and comfort. An inviting Farmhouse Timber finish and faux Forged Iron meal and hardware infuses your urban retreat with elements plucked from the countryside landscape. 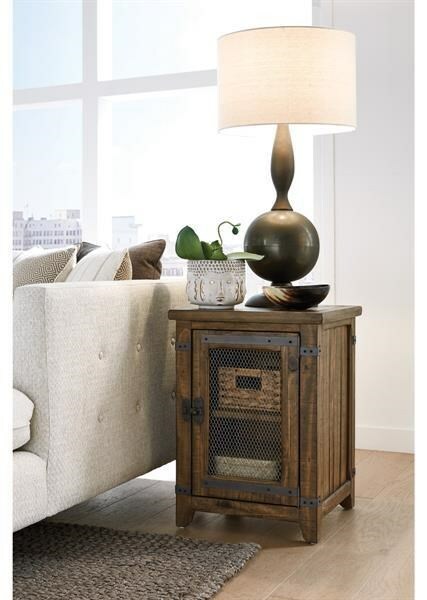 The T4717 Chairside End Table by Magnussen Home at Furniture Fair - North Carolina in the Jacksonville, Greenville, Goldsboro, New Bern, Rocky Mount, Wilmington NC area. Product availability may vary. Contact us for the most current availability on this product. The T4717 collection is a great option if you are looking for furniture in the Jacksonville, Greenville, Goldsboro, New Bern, Rocky Mount, Wilmington NC area. Browse other items in the T4717 collection from Furniture Fair - North Carolina in the Jacksonville, Greenville, Goldsboro, New Bern, Rocky Mount, Wilmington NC area.